An unamed piloted was scrambled to pursue a "dome-shaped object" that was hovering over the area. *Blue Book investigator Major Donald Rupplet admited that he was unable to explain away the case, though Blue Book personnel declined to classify it a genuine unknown. July 19, 1952. Andrews Air Force Base "Huge fiery-orange sphere" was hovering. March 9, 1955. Paris, Illinois After this the UFO hovered and pulsated and churned up and down. August 22, 1957. Cecil Naval Air Station, Florida Their car stalled as the UFO hovered in front of them. November 4, 1957. Sno Vicente (Fort Itaipu), Brazil Sentries received burns as UFO approached and hovered. Witnesses: Charles Brew, Trevor Brew. The UFO descended to a height of about 30 metres, hovering over a stringy-bark tree. March 12, 1965 Everglades, East Fort Myers, Florida. Witness: James Flynn. It was hovering, shaped like a broad, upside-down cone, an estimated 200 feet in the air above some cypress trees. Keyhoe, Donald E., and Lore, Gordon I. R., Jr. Strange Effects from UFOs. NICAP, Washington, D.C. (1969), pages 12-16. Hall, Richard. Uninvited Guests. Santa Fe, New Mexico (1988). pp 250-251. Clark, Jerome. The UFO Encyclopedia: Volume 1 (2nd Edition). 1998. pp. 362-364. April 22, 1966. Alliance, Ohio. March 16, 1967. Malmstrom AFB, Montana UFO hovering above the front gate. Witness: Arvi Juntunen. Device hovered and swayed about 0.5 meters above the ground creating counterflow around it. Patrolman Herbert Schirmer. The UFO appeared to be a mere 6 to 8 feet above the road, and was hovering in the air with a slight tilt. Then the object began to slowly ascend, making a siren kind of noise, and issuing a flame-like display from the underside. 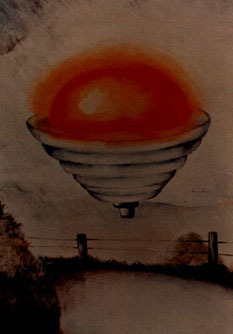 The Case was investigated by the northern representative of the Tasmanian UFO Investigation Center, and subsequently reported to Flying Saucer Review by. W. K. Roberts. Hovered over the middle of the road about 30 to 35 yards. November 17, 1976. Simi, CA Egg-shaped object stationary next to cloud. Witness's car radio is overtaken by a clear, continuous beeping sound. February 24, 1977. Langenargen, Lake Constance Germany. Witness: Rudi Grutsch. Two 1.1- to 1.3-meter-tall humanoids, round heads, slanted eyes, long arms, with hovering elliptical UFOs, bright illumination of area. Wednesday, March 22, 1978 Patapsco State Park, Maryland. Witnesses: Barry Smith, Gary Oikle. The object moved very slowly, hovering at times, in a southeastern direction following the contour of the ridges just above the trees. October 21, 1978. Moorabin, Victoria, Australia Pilot Frederick Valentich: "He's flying over me two or three times at speeds I could not identify...It's hovering (on top of me), and it's not an aircraft." Witness: Police officer Alan Godfrey. Godfrey turned around and examined the spot where the UFO had hovered. The road was very wet as it had rained heavily earlier in the night. But just at this one location was a circular patch where the roadway had been dried in a swirled pattern. One object still hovering over Woodbridge base at about five or ten degrees off the horizon. The object was hovering or on legs. 1986. La Jolla, California The witness, who at the time was wheelchair bound was resting alone in a beach near la Jolla when out of nowhere a large 100-foot long torpedo shaped craft approached and began hovering above him. The witness entered into a light trance and was somehow lifted into the hovering craft. He was then examined by several small humanoids with large heads and huge slanted eyes. He felt no fear. Later he found himself seated inside his van, his wheelchair neatly tucked away in the back. Incredibly, over the next few weeks his condition began to reverse itself until he was finally able to walk again with the help of a cane. The incident is just one of around 1,200 sightings recorded by investigators between 1987 and 1993, according to the files released by the National Archives on Sunday. On another occasion, military officials took the unusual step of briefing ministers about an unidentified flying object photographed in the sky over Scotland alongside an RAF fighter jet. Witnesses claimed to have seen the large diamond-shaped object hanging in the air for about 10 minutes before it ascended vertically at high speed. Fearing intense media interest, investigators also commissioned detailed drawings of the object. (CNN.com/europe) Dog walker 'met man from another planet' Ministry of Defence National Archives releases details of recorded UFO sightings from 1987 to 1993. The Corydon Democrat June 19, 1987. Article written by Lynne Hansen. Tim and his then 12-year-old son observed the details on this controlled craft hovering over their driveway. November 8, 1998. Jamaica, Queens NY Witness saw a boomerang shaped object hovering over the park. Chicago, Illinois Pilots, mechanics and managers from United Airlines witnessed a metallic disc-shaped object hovering over the United Airlines Terminal at Chicago's O'Hare Airport. Cylinder indentations observed underneath collosal craft with heat waves. Ricky Sorrells, Metal Welder and Machinist, Dublin, Texas: “For some reason, I don’t know what, I look up and look back down. I don’t know what made me look up, but then I realized what I had seen with my eyes and immediately looked back up. There was this thing. It covered from – I could not see the edges in my tree canopy. I couldn’t see the front of it. I didn’t think about looking behind me to see if I could see an edge that way.